Recipe Instructions: First make the bottom layer of the Red Velvet Oreo Weed Brownies. Then make the red velvet layer and stack on top of the bottom layer in the pan. Bake for 35-40 minutes. Remove the weed brownies from the oven and put the pan aside while you heat up the dank chocolaty topping. Pour on the topping and let cool. Learn how to make Red Velvet Oreo Weed Brownies. 3 delicious layers of chocolaty cannabis infused brownies makes this recipe a hot dessert for medical or recreational marijuana users. Weed brownies are one of the most recognized cannabis infused desserts. 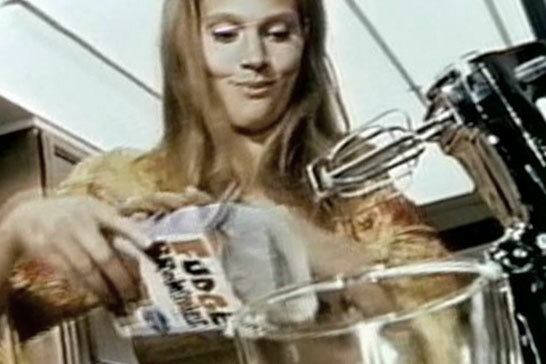 The popularity of weed brownies has existed in culture for decades, for instance in the the 50-year old American counterculture film ‘I Love You, Alice B. Toklas’, named after the woman who authored a cannabis cookbook. 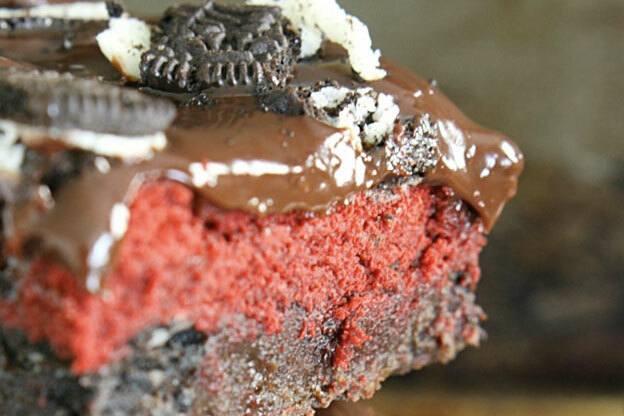 Red Velvet Oreo Brownies are the latest dessert trend throughout the country. Known for their rich chocolate decadence, the Red Velvet Oreo Brownies made in the following recipe uses cannabutter to infuse cannabis into the brownies, so if you don’t have that already learn how to make cannabutter first. This recipe yields 12 weed brownies. The first step to making Red Velvet Oreo Weed Brownies is to preheat the oven to 350 F (00C). You’ll need a 7-inch by 10-inch baking dish or similar sized pan lined with aluminum foil to cook the brownies in. Lube up the foil with cooking spray as to not make your weed brownies stick to the bottom. Now it’s time to get a medium-sized pot and put it on the stovetop on low heat. 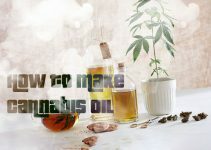 You are about to simmer the mix of cannabutter and chocolate chips, which will create a great potent THC-CBD infused edible depending on your cannabis preferences. Continue simmering the cannabutter and chocolate chips until the are completely blended together. After that’s done you can turn off the heat and put it aside. Let’s start on the bottom layer mix. Find a bowl and put in the flour, cocoa powder and salt. This will be put into a larger bowl after you whisk up the mix. Get the mixture worked and whisked well and we can move onto the next step. Take a bigger bowl for the rest of the bottom layer mixture. Put in the eggs and sugar first and quickly whisk the eggs to break up the yolks. Now you can add what’s in the other bowl and mix them all together using a soft spatula or wooden spoon. Time to pour in the cannabutter and chocolate chip mixture you made before. Stir in a circlular direction as you stream in the cannabutter and chocolate into the bowl. Keep on working your brownie mix until you are satisfied with the consistency. A fine consistency mixture will help distribute the cannabutter and fudge throughout the brownie layer. Now just spread the resulting batter into the baking dish. Once you’ve leveled it out you can garnish on the Oreos and that will be it for the bottom layer. Don’t put the pan in the oven Time to move onto the Red Velvet layer next. We’re taking the easy route on the red velvet cake, by using boxed red velvet cake mix. Alternatively you could make your own such as this recipe does, however there are a number of premium and organic red velvet cake mixes available to buy, which makes the process much easier for time. Heat up half-a-cup of cannabutter in a pot first. Then you’ll need a medium bowl to mix together the eggs and cake mix. 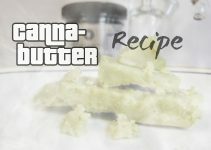 Pour the melted cannabutter into the bowl and continue mixing until a thick dough-like consistency is obtained. Now you can take that dough mixture out and layer it on top of the bottom layer in the pan. Time to start baking. Put the pan in the oven and bake the Red Velvet Oreo Weed Brownies for 35-40 minutes. You don’t want to overbake these rich brownies, part of their magic is the wet gooey chocolate goodness that results from proper baking. Once the brownies are ready, take the pan out of the oven and let it cool off for a bit. We’re going to make the chocolate and oreo topping which takes the flavor and gooeyness to the next level of decadence. To start this chocolaty masterpiece you’ll need a large bowl. First put in the chocolate chips. You can use milk chocolate chips or dark chocolate chips, even white chocolate if that fits your fancy. Heat up the heavy whipped cream in a pot on the stovetop on low temp. Once the cream starts rapidly bubbling, pour it into the pot with the chocolate chips and put it aside. While the mixture is cooking you’ll want to whisk the cream and chocolate mix until they are blended together well. 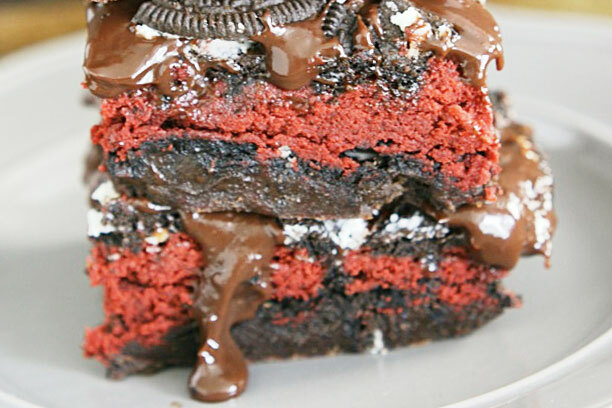 Now simply pour the chocolate and oreo topping onto the red velvet brownies in the pan. Add the rest of the Oreos cookies on top and let it cool down. Congratulations now you may enjoy the sweet decadent taste of these Red Velvet Oreo Weed brownies. 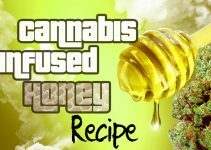 You’ll love the rich chocolaty flavor and remember to start slow if you used extra potent cannabutter. These weed brownies are visually beautiful and make a great gift for parties and other special gatherings. Eat up and stay high.